A long time ago in a month far far away we ate a king cake. (February, to be precise) This king cake was homemade and filled with cinnamon cream cheese goodness, with a lima bean for the baby. T: we went into a blogger’s black hole there for a little while. 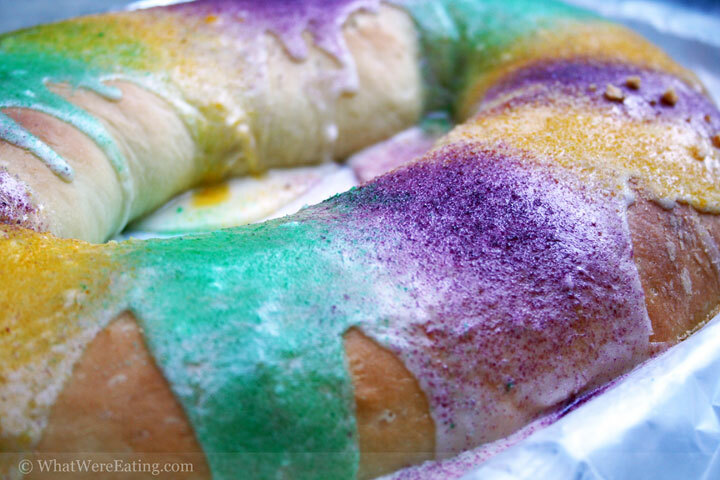 Heheh, now we’re back and talking about a king cake that you made in February. A: if by black hole you mean black hole of family visiting. does that make sense? anytime we have visitors we seem to be distracted from the bliznog. T: yeah, it’s hard to blog with company over. house guests tend to get angry when we do use the computers. A: not to mention they like to eat out and at weird un-sunlit hours. T: that’s true, we’ve been eating out for nearly a week. I can’t wait until we eat some more Mandy food. A: now tyler don’t make me slap you for that mandy crap! you know hommie don’t play that. T: what, I was just talking about how awesome your cooking is! A: the message seemed to get blocked by the word mandy – which consumed my mind negatively. T: How bout if I call you Mandi and place the accent on the second syllable? Mandi. Eh? Sounds european. A: heheheh still not workin’ for me, T! how about amanda? how’s that sound? T: that sounds played out. How bout Mandita? It’s like a little Mandy. A: or even a little manda… mandita’s not as bad as mandy. T: how bout Mandisima! That’s like “very Mandy” or something. A: woah woah woah, dog! all this mandy has made me forget about the king cake we are trying to blog from ages ago! what did i put in the middle? i think it was like a cinnamon-cream cheese filling or something. T: Yeah, I think that’s right. I remember being very impressed at how good it was. I believe my mom said it was the best King cake she had ever had. It was moist, delicious. It was competitive with any king cake. It was possibly the best king cake in Socal last year, although we really have no way of knowing that. A: perhaps it was even the only king cake in Socal last year! i don’t think they do king cakes around here…but you’re mom has lived in south-east louisiana for her entire life (until last year) so her words are praise enough for me! T: Hey, how about me? I’ve lived in south Louisiana for 24 years myself. Doesn’t my opinion count for anything? T: I will rate the king cake whether you care about my opinion or not! In this case it happens to be positive, but don’t forget who is rating your dishes! Mu Hah. Be careful Mandisima for I hold great power. mu hah hah. moo. muhahahahha. Umm… I rate the king cake a 4.6/5. It was so danged good I wish king cake were in season right now. A: heheheh btw, i do care about your opinion, crazy boy! A: and i’m happy it’s a good opinion. I do remember this king cake in a very positive light. I give this king cake in retrospect a 4.5/5. I wish we had been back to blogging when we originally ate it, but hey! what’s better than a little mardi gras in July? they have christmas in July! T: Yeah, sickos have christmas in July. A: cheap mofos have christmas in July! 😛 and marketing people who want to make consumers buy more! T: Damned christmas in July. I won’t stand for it. This conversation is over. How about Manders? I’ve never had a king cake ever! The purple and green colors scare the crap out me…those aren’t normal food colors! But this cake looks totally yum. Me want. That sure is a purty king cake, Miss Manders! Why thank you, Miss Feather!! !